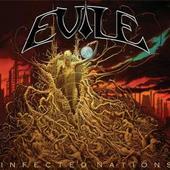 UK thrash metal upstarts Evile’s sophomore effort, "Infected Nations," is an undeniable nine-track homage to the Golden Age of thrash that digs deep to excavate inspiration from some lesser known acts besides the Rushmore-esque Big Four. There’s a hearty smattering of Annihilator, Kreator, and Bay Area bashing that you can almost swore you heard from the likes of Vio-lence or Forbidden before pervading through the brazen Megadeth-like twin guitar explorations (“Now Demolition,” “Devoid of Thought”) as well as a discernibly thicker sound and slower pace than previously employed by the band (“Metamorphosis”) that manages to keep the head banging and the attitude intense while the band forges into a different subset of thrash metal waters. Rendering a mixed bag of B-list influences and lengthy tracks whose running times lend to spells of atmospheric meandering, this disc is a far cry from their debut yet definitely puts the band into a whole new light, fortifying their latest metallic mission with ambition that helps to fuse the elements together as well as help their thrash under the microscope approach escape full collapse. 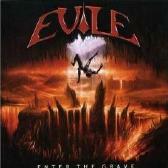 For more information, check out http://www.evile.co.uk. Relive the golden age of thrash metal with UK sensation Evile and their walloping 10-track release "Enter the Grave." This quartet, produced by the man responsible for Metallica's early work (Fleming Rasmussen), exhibits the kind of vintage speed freak rhythms and hearty headbanging riffs that helped bands like Megadeth and Testament ascend to the heights of the metal realm. Cuts like "Man Against Machine" and "Burned Alive" stay tried and true to the genre right down to the blistering lead guitar solos, while "We Who Are About to Die" take it down a notch by working at an overall slower pace while keeping the intensity at a fever pitch a la Overkill and Vio-lence. Looking for a new soundtrack to do the toxic waltz to? Maybe need some new tunes to spread the disease and climb over the wall with? Look no further, denizens of the denim jacket patch era, your new favorite band is here to dole out some 1986-style whiplash.